View “Art in Action,” listen to music and hang out with friends! This two-hour event takes place outside on THELMA’s Plaza! 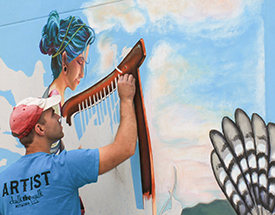 Get out, grab a drink and enjoy the sunshine while seeing artists paint “in action” to live music! Multiple artists will be painting in response to live music that will be played by the Kyle Megna and Ross Catterton Duo to encourage art making in the moment. This is a great way to be surrounded by artists and to work in a positive and creative environment. Voting will take place and prizes will be awarded to top painting contestants. Kyle and Ross are two strong song writers that play in the same band Kyle Megna and The Monsoons! Their “dark-indie-blues-folk-rock feel” is a magnetic force that’s ever-charged with surges of creativity and artistic experimentation. Fused with a healthy dose of spontaneity and humor, Kyle and Ross channel a “can’t-get-enough energy” that’s good for the soul. Participating artists are provided with all materials (canvas, paint, brushes, etc.) to create their painting.